One of the biggest challenges of waging war anywhere is supply logistics to deployed troops. The supply challenge becomes even more formidable when the war theater is a landlocked country located thousands of miles away and involves transit through one or more other countries and international border crossings. The United States military has been facing such a challenge since it deployed in Afghanistan in 2001, and it's become only more difficult since the Obama troop surge in 2009 and worsening ties with Pakistan. There are three different routes being used to supply US troops in Afghanistan: Pakistan Lines of Communication (PLC), Northern Distribution Network (NDN), and Airlift. Pakistan routes are the fastest, shortest and least expensive way to supply US forces in Afghanistan. The routes begin at the Karachi port in Pakistan. One goes north toward the logistical hub at Bagram Airfield, and the other west toward Kandahar. These have always been the primary option for American forces, being the shortest and cheapest, requiring only one border crossing, and minimal time on the road inside Afghanistan. Nearly 60,000 trucks drive more than 1,200 miles through the length of Pakistan every year carrying supplies and fuel. According to varying figures provided by U.S. and NATO forces, 40 percent to 60 percent of all military supplies used by coalition forces in Afghanistan come through Pakistan. Figures released by the Pakistan Federal Tax Ombudsman illustrate the surge in traffic at Karachi’s port. U.S. military equipment received at the port rose from nearly 16,000 shipping containers in 2005 to more than 54,000 in 2009. Halfway through 2010 the U.S. military had already shipped nearly 30,000 containers to Karachi. The spike in US supplies through Pakistan has spawned a huge trucking business controlled mostly by Pashtuns from FATA, also known as Pathans, like Shakir Afridi who is quoted at the beginning of this post. His own fleet has grown from a few vehicles in 2001 to nearly 4,000 flatbeds and more than 3,000 fuel tankers that haul military supplies into Afghanistan. His quote is indicative of the depth of anger shared by most Pakistanis at the slaughter of 24 Pakistani soldiers by the US troops last November. The NDN route is longer, slower, and six times more expensive than the PLC route through Pakistan. It involves multiple modes of transport through several countries in Europe and Central Asia. Many are under strong Russian influence, and some do not allow military gear to be transported through their territory, according to a Businessweek report. 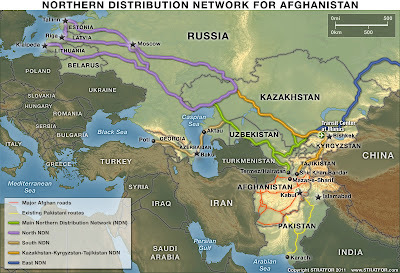 A network through Central and Eastern Europe and Central Asia that crosses through at least 16 countries, using a combination of roads, railway, air, and water to move supplies in from the north. The chain can be complex and circuitous. One path through the network, for example, might involve military cargo that arrives by sea in Istanbul. From there it travels the width of Turkey on truck and crosses the northern border into Poti, Georgia. In Georgia the equipment goes by rail to Baku in Azerbaijan, where it’s loaded onto a ship bound for the Kazakh Port of Aktau, across the Caspian Sea. Then it’s put on trucks for the 1,000-mile ride through Kazakhstan, then a train through Kyrgyzstan and, finally, into Afghanistan. This is the most expensive option and it, too, relies heavily on Pakistan's cooperation. US Air Force carriers are already airlifting supplies to Afghanistan, but their use, at this stage, is “imperceptible” given the $14,000-per-ton cost of moving goods this way, according to a US government source. Most of these flights are routed through Pakistani airspace. If the relations get worse, the Pakistanis could shut the air-link to the US military. “If you look at the trajectory, it’s clear which way the [US-Pakistan] relationship is going. It will be difficult to overcome yet another serious problem. The policy implication is that we need to diversify [transit routes] as much as we can and as quickly as we can. That’s what the US government has been all about recently,” an unnamed US government official told Deirdre Tynan of Eurasianet. Regardless of the rhetoric emanating from Washington, the fact is that the US is very likely to remain heavily dependent on Pakistan for the foreseeable future. At a congressional hearing this year before the border incident of Nov 26, Lieutenant General Mitchell H. Stevenson, the U.S. Army’s Deputy Chief of Staff for Logistics, was asked what the “long term impact” would be if the supply route through Pakistan was “suddenly shut down.” After explaining that the Army kept a 45-day supply of reserve fuel on the ground in Afghanistan, the general said they could only “last several weeks” without any significant impact. Pakistan has the longest border with Afghanistan and wields more influence there than any other country. It also provides the nearest seaport to Kabul. That is the fundamental reason why the U.S. has provided more than $20 billion to the country over the past decade, much of it to ensure supply logistics to US troops. “If we want to be successful in Afghanistan,” as General James L. Jones Jr., former National Security Advisor to President Barack Obama, said in recent congressional testimony, “the roads to that success have a lot to do with Pakistan.” Given these ground realities, the sooner the US apologizes to Pakistan for the Nov 26 incident to try and restore ties, the better it will be to achieve an end to the longest war in US history. Article and the response might give more feedback on what american feels about this incidence. PAkistan is in no position to threaten/blackmail the US. The US could also blockade PAkistan's sea routes if it is pushed beyond a point.What is Pakistan gonna do then? Anon: "The US could also blockade PAkistan's sea routes if it is pushed beyond a point.What is Pakistan gonna do then? " If you think it's that simple, I wonder why the US Navy hasn't already blockaded Iran which is seen as a threat to US interests and oil supplies through the Strait of Hormuz? Or blockaded North Korea which continues to pose a threat to US interests in East Asia? Just apologizing is not enough---Sam must compensate at least 10 million dollars per person killed by him throughout the Afghan War. Even with a hundred trillion dollars per head, those lives can never be brought back. Do u think pak can get away by making life difficult for US? If you think so u r living in a world of fantasies. US is and going to be an influential player in south asia for a long time to come. They can and will cause economic hardships in Pakistan. This will lead to social unrest. I hope you know we are not like countries in the middleast with plenty of oil resources. Why do you think we have electricity and fuel supply problems when there is so much of demand? Anon: "Do u think pak can get away by making life difficult for US?" Neither the US nor Pakistan can get away with making life difficult for each other. Recognition of strong mutual dependence will likely help resolve the issues and keep the difficult relationship intact for the foreseeable future. Farmers and traders in eastern Afghanistan say that despite a decade of foreign development projects, they remain economically dependent on their neighbors in Pakistan. The main bazaar in the capital, Jalalabad is crowded with people buying and selling fresh melons, ripe tomatoes and sacks full of onions and potatoes. Fruits and vegetables from all across the country come to this market where it is sold to locals. But due to unreliable electricity and cold storage a lot of Afghan farmers' produce goes just across the border into neighboring Pakistan where it is stored and then re-sold. "My name is Allah Mohammad," a local vegetable seller says introducing himself. He is selling his tomatoes from one of the many produce carts that line a busy road. "We have heard there are no storage facilities and electricity. But in Pakistan they have facilities and electricity," he says. Not far from the market, at the main loading station, onions and potatoes are being inspected and then loaded onto trucks headed for Pakistan. Gul Morad, head of inspection and regional chief for fruit and vegetable traders whose office is above the station says matter-of-factly, that cold storages do exist in the districts. USAID says the deserted units do not appear to be theirs. The agency did however help fund Morad’s 24-ton cold-storage which he pays to maintain. The unit runs on both generators and power from the electrical grid and is a key part of the local economy. Morad says most of time (when market prices go down) farmers and shopkeepers bring their produce here and store it for one or more days - for free. When the market gets better they take it out and sell it. Local farmers and traders say proper refrigeration means higher profits, because they can store their own produce and make a better return in the off season. However with too little cold storage, residents now rely on stored produce imported from Pakistan, which can sell for nearly triple the cost. Many people, like farmer Ihsanullah from Ghawchak in Sukhroad district believe that some of the marked up vegetables are originally from here, but are imported into Pakistan, stored and then sold back into the Afghan market. Inspection chief Morad disagrees and says the stored goods that come to Afghanistan are grown in Pakistan. But both men agree that farmers and consumers both suffer from the lack of local refrigeration. PESHAWAR: Posters of turbaned Afghan presidential candidates are rolling off the presses in Pakistan, which will be keeping close watch on the election in its strategic backyard. Helped by cheaper labour and a favourable exchange rate, printers in Peshawar, less than 60 kilometres from the border, have been busy making Afghan election banners. “We have been swamped with work for the past two weeks because of the Afghan elections. One candidate has asked me to print 200,000 posters,” said printer Mohammad Sajid. Business links with Afghanistan have grown in recent years and analysts say Pakistan wants a stable northwestern neighbour, shifting from the interference of the past. Fear of encirclement by arch-rival India led generations of Pakistani military thinkers to view Afghanistan as a zone of potential risk – and thus legitimate space for covert intervention. Afghan officials still regularly accuse Pakistan of colluding with militants, most recently over an assault on a luxury Kabul hotel that left nine people dead. Pakistan vigorously denies the claims and Prime Minister Nawaz Sharif has worked hard to improve ties with President Hamid Karzai, who is stepping down after serving the maximum two terms in office. “I think this change started in the previous government and Pakistan sticks to the policy because probably they have realised this ‘one favourite’ policy has been a disaster,” author and defence analyst Imtiaz Gul of Islamabad’s Centre for Research and Security Studies told AFP. During the last Afghan presidential election, some Pakistani officials were more favourably disposed towards incumbent Karzai, who shared a good rapport with his then-Pakistani counterpart Asif Ali Zardari. This time, however, Islamabad has been careful not to side with any candidate in Afghanistan’s first ever democratic transition of power. Pakistan may be reluctant to antagonise whoever might emerge victorious by backing an opponent, but as Gul noted, it also does not have an obvious ally among the three leading candidates. Zalmai Rassoul is seen as the preferred choice of Karzai, with whom Islamabad’s relations are at a low ebb. Former minister Abdullah Abdullah draws support from the Tajik ethnic group, who have not favoured Pakistan, and economist Ashraf Ghani has “no connection” with Islamabad, Gul said. Though it may not have a candidate of choice, Pakistan remains a significant player in the election because its border areas serve as a rear base for the Taliban, who have vowed to disrupt the ballot and already claimed a series of attacks. “They (the Pakistani government) want peace and stability on the Afghan border because it has a direct impact on peace and security in Pakistan,” said Saifullah Khan Mehsud, an expert on Pakistan’s restive tribal border regions at the FATA Research Centre. Pakistan also fears a new wave of Afghan refugees, who currently number some 1.6 million having fled in the aftermath of the withdrawal of Soviet forces in 1989. While the refugees were able to vote in 2004, no arrangements have been made this time around. “We’re frustrated, we’d like to have a say about the future of our country,” said Haji Jumaa Gul, an elderly man at a refugee camp in Peshawar, who says the situation at home is still too volatile to return.